March is synonymous with madness. Spring temps get peoples blood pumping, the whiskey flows on St. Patrick’s Day, and all that contributes to the insanity of trying to predict who will win college basketball’s national championship. One might think that after filling out brackets for 35-plus years a person would learn a thing or two, but the circumstances are never the same – especially these days when impact players rarely stick around for more than a single season. This has brought an unheard of level of parity to college basketball. It allows teams like George Mason, VCU and Butler to find their way to the rarefied air of the Final Four. This feast or famine mentality also impacts entire teams – like what the University of Kentucky and its fans are experiencing this season. The Kitty Kats went from winning the 2011-2012 title, to not even qualifying for the tournament this year. Mercifully UK’s season came to a whimpering end Tuesday night in a 59-57 loss to an inspired Robert Morris team in the first round of the NIT. 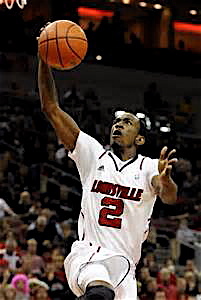 The “Russdiculous” one, Louisville’s fearless junior guard Russ Smith. The hopes of the Bluegrass this time around rest with Rick Pitino and his mature-laden Louisville Cardinals. This is one of those unique seasons where there really is no overwhelmingly power team that is head and shoulders above the others. All season the Top 25 has been a constantly changing bumper car ride of teams winning and losing, especially in the top spots. No one has held the No. 1 ranking long. At the moment Gonzaga has the honor, but its conference and schedule aren’t as strong as most schools from the power-conferences, which makes prognosticators question the Zag’s ability to make a deep run in the tournament. It’s considerations like these that make filling out brackets for the “Big Dance” so amusing. All 67 games must be picked before the first ball is tossed into the air. It’s quite the challenge to have teams that play in all manner of different conferences, with varying levels of competence, come together under a unified post-season where anything can happen. It’s single elimination play, so those picking teams in the brackets don’t get the benefit of seeing if the real North Carolina team shows up, or Missouri recognizes they must take care of the ball; once the whistle sounds it’s game time. Teams must make adjustments on the fly or they go home. It’s unforgiving, unpredictable and full of buzzer-beating upsets. There is no experience or preparation that makes it easier to predict which teams will win the 8 seed vs. the 9 seed games: Colorado State/Missouri; Pitt/Wichita State; UNC/Villanova; and NC State/Temple. Several of these teams have done well in the tournament before but that all goes out the window – no telling which is really stronger. That will be the theme throughout the 2013 tournament. Since no team is stacked with talent, like Kentucky was last year, individual match-ups and styles will likely determine more outcomes than usual. It’s hard picking against the top seeds because they’ve achieved a high level of success throughout the season, but statistically, only around 42 percent of the No. 1 seeds reach the Final Four. So picking the brackets becomes about leveraging favorites along with picking upsets, but without exposing yourself to unnecessary risk. That is a delicate balance. 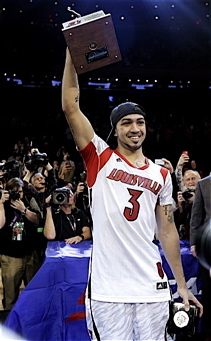 Louisville’s senior guard Peyton Siva. These considerations make a pick like Louisville extremely attractive. Yes they are a jump shooting team technically, but they are amazingly fast, defensively oriented, and can score the ball in transition, half-court or in the paint. They also are a deep team, and have senior leadership in guard Peyton Siva. They are not without flaws. Sometimes Siva’s scoring disappears for entire games, or Russ Smith displays questionable decision making – but the Cardinals find ways to win. I like how Louisville walks out on the court fearless. They know they are going to win. 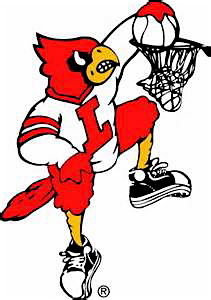 Now I wouldn’t recommend getting down 15 to anyone in this tournament like they did Saturday against Syracuse, but U of L didn’t rattle, and came out in the second half to outscore the Orangemen 40 to 10. That was impressive. Indiana is a solid club as well, but Miami runs a pro offense, and if the Hurricanes can shoot like they did in the ACC final, they could send the Hoosiers home. Kansas is another dangerous squad, peaking at the right time, but damn they have a hard road to travel. Of the four No. 1 teams, that leaves Gonzaga, which has legit talent, a chip on its shoulder, and the easiest bracket in terms of advancement. There are numerous early games that qualify as genuine head scratchers: OK State/Oregon; Creighton/Cincinnati; Wisconsin/Mississippi; Notre Dame/Iowa State; and UCLA/Minnesota. My Final Four is: Louisville-Gonzaga-Michigan-Miami. Louisville Cardinal’s head basketball coach Rick Pitino. 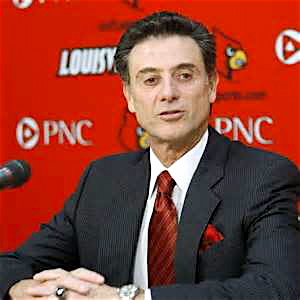 I’m hoping experience and speed is enough to earn Rick Pitino and Louisville a championship. As for Kentucky, don’t shed any tears on their behalf. Wednesday the Wildcats received a commitment from power forward Julius Randle, all 6-foot-8, 240-pounds of him. Randle, from Plano, Texas, was rated the No. 2 overall prospect in the country, and became the sixth McDonald’s All-American to commit to Kentucky. He joins “The Twins,” Andrew and Aaron Harrison, James Young, Dakari Johnson and Marcus Lee, along with Derek Willis. Kentucky already had the No. 1-rated recruiting class before Randle committed. Now experts are talking about this being the best class in the history of college basketball. After Kentucky’s loss Tuesday, current star freshmen, Archie Goodwin, Alex Poythress and Willie Cauley-Stein, all declared they would return next year, along with sophomores Kyle Wiltjer and Ryan Harrow. Most likely freshman-of-the-year Nerlens Noel will forego the remainder of his college career. Even though he blew his knee out late in the season, Noel remains projected as a high NBA draft lottery pick, only slipping from No.1 overall to No. 3. The scary thing about Kentucky is it remains in the running for Andrew Wiggins, the No. 1 high school recruit from Toronto. With or without Wiggins, there is more than playful banter about going ahead and just giving the 2014 trophy to Kentucky, to save teams the time and trouble. If I were Pitino, I would win with Louisville this year when the field is down, because he loses his triggerman in Siva, and there will be a Big Blue Monster back in Lexington come 2014. This entry was posted in Events, Travel and tagged Big Dance, March Madness, NCAA Championship, NCAA Tournament. Bookmark the permalink.